Albert Einstein was born in Germany in 1879 to a Jewish family (Albert Einstein, Nobel Lectures 1967). He was an average student at the Swiss Federal Polytechnic School in Zurich. While in school many professors strongly disliked Einstein. He also met and married his first wife, classmate Mileva Maric during this time (Einstein’s Big Idea, 2005). He graduated in 1896 with a degree in teaching mathematics and physics (Albert Einstein, accessed 2008). After graduation Einstein began working as a clerk in a patent-office in order to support his wife and children, but this really wasn’t enough. During this time Einstein wrote numerous scientific papers on theoretical physics, and had a few published. 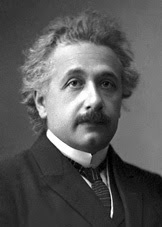 It was a paper submitted in 1905 to obtain his doctorate that earned Einstein success and fame (Albert, accessed 2008). While Einstein is most well-known for his E=mc2 work he did not win the Nobel Prize for this. In 1921, he won the Nobel Prize for his paper on the theory of the photoelectric effect (Albert, 1967). affectionate. She chose not to sign the ultimatum, and moved out with the children. They did not divorce right away, and Einstein actually bribed Maric into divorce. The bribe was that he would give her and the children the prize money if he were to ever win the Nobel Prize (Einstein, The History channel, 2008). After the divorce in 1909, he remarried within the year to his cousin Elsa Lowenthal (Albert Einstein, 1967). Einstein published three significant papers in the year of 1905. The year of 1905 is sometimes referred to as the “miracle year” for Einstein. The first paper he published in 1905 described the photoelectric effect. The photoelectric effect is when metals emit electrons when hit by a particular wavelength of light. He based his theory on Planck’s work that described electromagnetic radiation. Planck had discovered that light energy was proportional to frequency of radiation, but Einstein further interpreted this to show that light energy was formed by a collection of radiation (Albert, accessed 2008). Einstein received the Nobel Prize for his work on this paper. "Here, then, is the problem which we present to you, stark and dreadful and inescapable: Shall we put an end to the human race or shall mankind renounce war? People will not face this alternative because it is so difficult to abolish war." stance on the war, and the use of nuclear weapons only when absolutely necessary, as well as many other civil rights issues. Einstein died in April 15, 1955 in Princeton, New Jersey (Nobel Lectures, Physics, 1967). Dude, do you have any sort of clue at all regarding Einstein? Truth? No one would no who Einstein was today had he not been a rabid (rabid as in rabies, not rabid as in rabbi) Jew Zionist. There is a 1200+ page biography on him that you can download for free. Read it and be prepared to rethink everything you thought you knew about the Jew fraud known as Einstein. Albert Einstein was a genius and couldn't agree more to what he said about insanity. Thanks for share it with the readers..
prof premraj pushpakaran writes --Albert Einstein's century old theory about gravitational waves has been proved correct!! !